> Have you bumped into any steam punk stuff? I kinda wanna do a Steam Punk Set / Module In that setting. Very little, at least among the free content. Maybe a couple of flying vehicles. They didn't fit the theme though. It looks like there is some: turbosquid, OpenGameArt, ShareCG, Blend Swap, 3D Warehouse. There's no guarantee they'll port well though. High poly counts will rule out many; file formats will limit others. You just have to live with what you can get, or make your own. Some good models that will cross over there as well. Why would you not want a full size stone Rhino after all. I love your work and I think a sci-fi adventure would be really fun. I remember Buck Rogers Countdown to Doomsday and how it blended the popular Pool of Radiance with Sid Meyers Pirates in that you could engage other spaceships, board them and then capture them all the while in the oldie SSI gold box style combat. In the 80s-90s I was just a little kid and was like "What the what?!" So reading some posts I think I am understanding that some of the models just aren't compatible with NWN2? I looked at the websites you linked for steampunk and decided to search for camel models. There seems to be some good ones but I was wondering how I could tell if they were compatible. Anything can be compatible.. If you can get it into blender.. your good to go. For anything steampunk the answer is "gnomes did it". I also have a 3ds camel I got years ago. What tutorial or whatever are you all using? Maybe I can finally contribute something to the community after all these years. I would start with grabbing the MDB Importer for Blender and reading the PDF that comes with it.. Very helpful.. You can bug me if you need help. > So reading some posts I think I am understanding that some of the models just aren't compatible with NWN2? A camel model would be very welcome, but understand that I am just converting static placeables, not rigged and animated creatures. The problem areas I look at for when selecting a model to convert are a suitable license, a reasonable number of faces, the availability of texture files, and the model file format. The absolute limit for an mdb file is 65,535 vertices; so your faces will be likewise limited. For performance reasons I usually aim for 1-2,000 faces or so; fewer faces for smaller models, more faces for big ones. With smooth higher poly models it is sometimes possible to decimate and/or trim and remap them down to a useful range. I don't have a way to import .max models into Blender, which is major bummer. File types .dae, .3ds, and .obj usually work with the importer and are fairly common. I've had issues with .fbx models, but sometimes it works. You can also import NWN .mdl models into Blender using the latest Neverblender. It does help and I hope I didn't hijack your thread. I'll look for the mdb importer. I have the mdb cloner which I have yet to use when trying to figure out how Kamal did the flying carpet trick. Kamal, I read your wendersnaven joke and totally got it. It was nice to know someone felt my frusteration to some degree for there not being a camel in NWN2. Over the many years I've become less obsessed with camels, but I still have this 3ds file and I might as well use it as a placeable if not a creature. Just realized how much I sound like a weirdo. I'm not obsessed with camels I guess I'm obsessed with creating the right setting. No problem, Friar. Good luck with your camel. Meanwhile, I was very pleased to come across a nice bear skin rug model. It even included two different textures. Sweet! Does the rug come in polar bear? Frost giants want to know. Sigil in Planescape is pretty much steampunk/magicpunk/quasi victorian whatever. Not a ton of content though for that.. The old City of Doors Initiative (CODI) did a bunch of Planescape stuff for NWN, such as their content package and Sigil Exterior. Theres a whole bunch of planscape hopuses too. I think I'm gonna compile a package of Steam Punk Setting stuff.. and start throwing in some of my own as well..
> Any tutorials on making Placebles? I'm slowly putting one together, but it sounds like you already have it in hand. Without getting into too much detail.. I would love a tutorial on what rules a object has to follow.. and what it needs included. I know what's going on here.. Np there. Not sure what is on the C2.. looks like a cube with a Material on it? What does the Material signify? I noticed it was fully weight painted to zero? Anything I should be aware of here? As for the walkmesh.. I also see the Walkmesh has a list of materials.. Do you need all of them? or only the material(s) you plan to use? This egg is non-walkable.. but could I delete the other materials and just use W_dirt for example to make it dirt walkable? I guess it's handy to have the materials for copy and pasting walkmeshes in blender. Yes, I'm covering those. The C2 mesh is first collision mesh and is typically simple in form; C3 collision mesh, when used, is higher poly and a tighter fit to the model. For the walk mesh, the material setting determines the footstep sound. There's some information on this page. That washer dryer could almost pair as a submarie or spaceship window for an interior. You may have noticed from the front page that I posted the latest set. Feel free to modify and abuse them however you want. The combined set is now over 700 placeables, so there should be a fairly decent selection for modern scenario builders. I think I've exhausted most of the suitable free models available now, with the exception of buildings. Probably it needs a one or two new tilesets (commercial office and perhaps spaceship/futuristic interior), some modern garb appearances, and equipable gear like guns and tools. A selection of alien creature models would be nice as well, plus some more robots. 700 placeable objects is more than stock nwn2 has I think. Really? Well there's a lot of smaller-size Modern placeables (like tools and food containers), whereas the stock set is pretty sparse in that area. 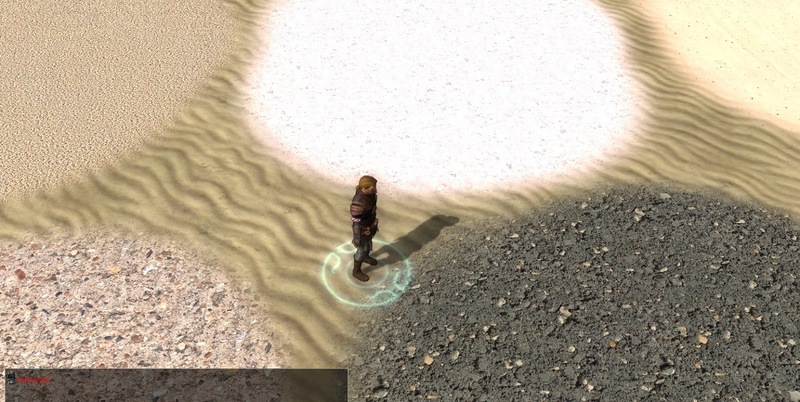 On a hunch I tried modifying the planet placeables to use the UV Scroll parameters to make them spin. Turns out it works very nicely. 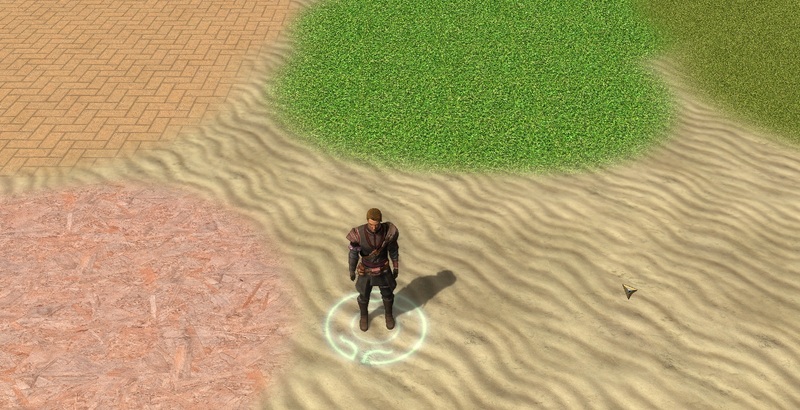 Just by giving them a small U value (0.01-0.04) they will gently rotate with no discernable texture issues. Ed. : I've expanded the set to 50 placeables, including some stars. I tried an experimental port with a really large office building, shown below. This is a simple, boxy, low-poly model that is probably intended for environmental decoration. Unfortunately, when the PC gets close to the building (at around 1-2 body lengths) the camera goes all funky, showing me the PC from inside the structure. I'm starting to think these won't work in NWN2. Plus the texture files are pretty huge at 2048x2048. But maybe I'll try adding collision meshes and a walk mesh, then see if that makes any difference. Yep, adding a C2 mesh fixed the camera problem. The game engine may have an issue setting up the bounding box correctly when there are no collision meshes. Of course, I've run into issues when there are collision meshes. It's a finicky little beast. I surely could use this. Good stuff. I also noticed that the C2 collision box has an impact on the shadows created by the model: forget to include the C2 part in the mdb, and you'll get weird black rectangles/lines, depending on how close you are. Huh, that's good to know. I've been skipping adding C2 mesh to simple shapes, but that'll give me a good reason to include them. Note sure the that the PM was sent. Thank your very much. Downloaded. Your sundry collection looks impressive. I've already amended a couple of maps using the new modern placeables you kindly provided me with. 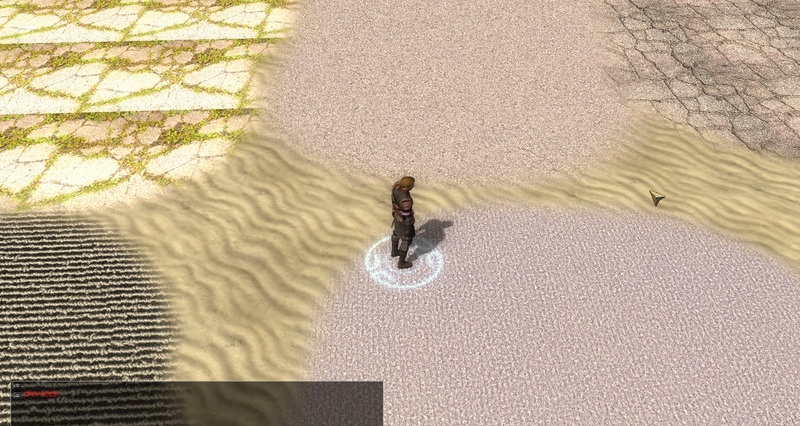 If I find time before leaving, I'll start a new area using the offices and post a snapshot. Yes I received your reply. Sorry, I didn't know you were expecting a response. Glad you like them. 2 snapshots of an unfinished area (no tree, no vegetation, no people, no lights, missing props), that show rjshae's offices. Central square and view from one office. This is the first area of module 7. 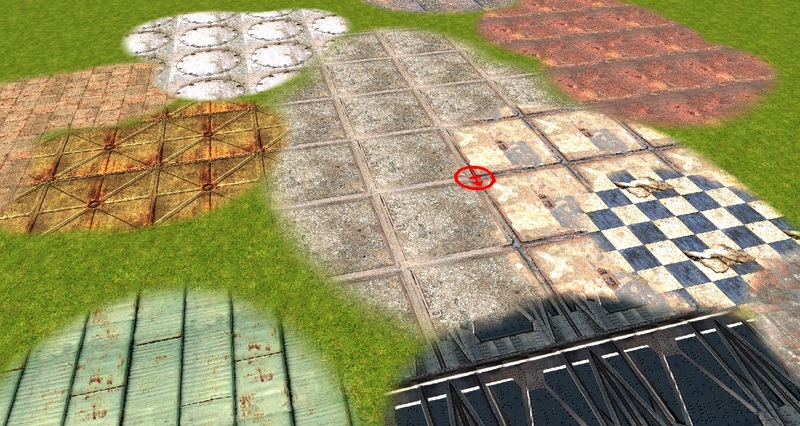 I was thinking that a set of seamless exterior ground textures could be useful for a modern setting. 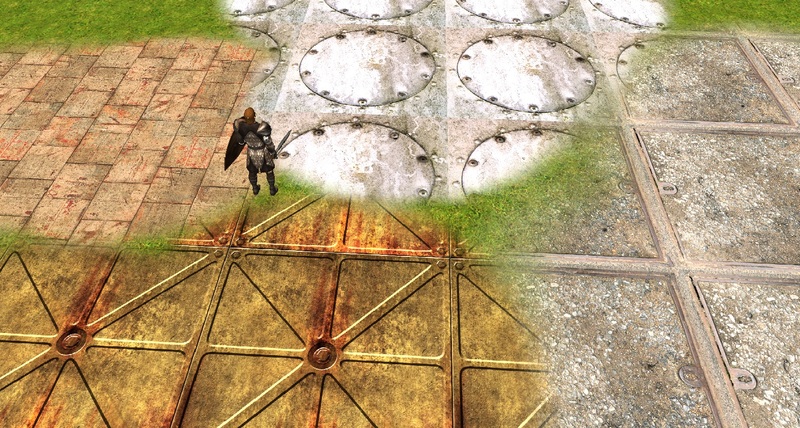 Various asphalt textures, concrete sidewalks, gravel beds, rock walls, brick walkways, metal gratings, and trash piles. Good suggestion. 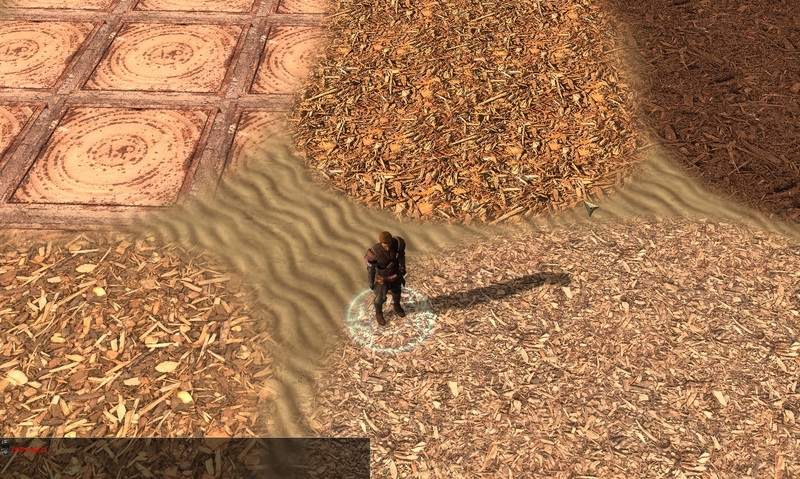 It does have some nice textures, suitable for a dirty, grungy environment. 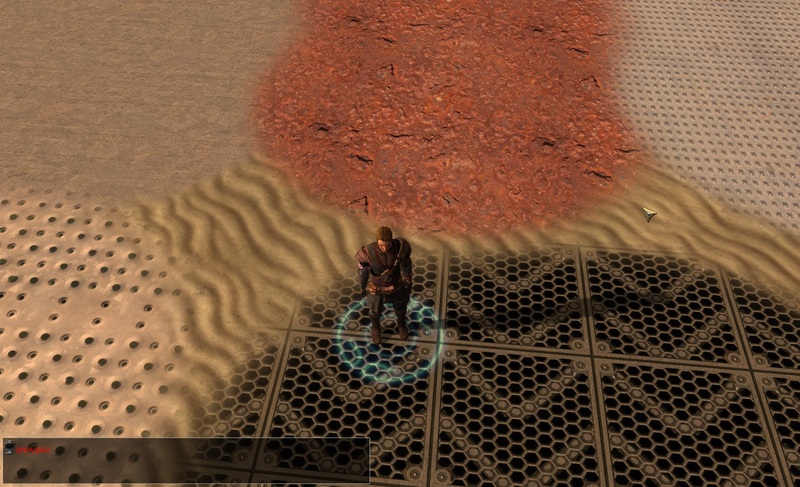 Adding ground textures is pretty straightforward, I made a big pack. I will see about adding some modern type textures. Here are some of the "modern" type exterior textures in my existing exterior texture pack. There's no textures in there for things like asphalt roads, but I could add some. Yes, those will probably be useful. I checked the Sigil textures, but they are only 512x512. 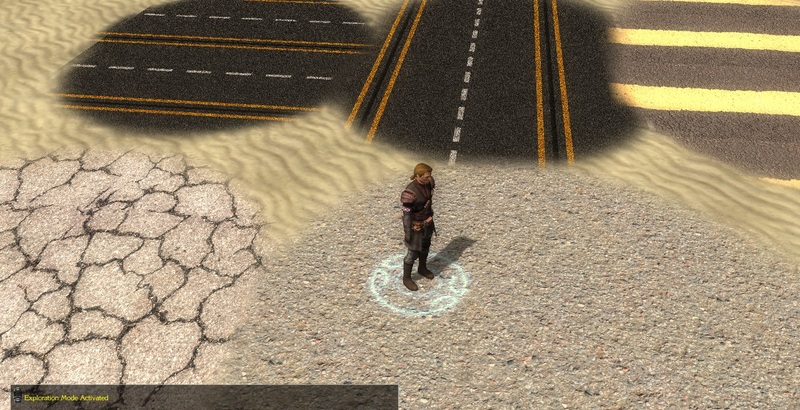 Some work may be needed to get things scaled to the modern placeables, but here are asphalt road textures. There is a vertical (north south road) and horizontal (east-west). As I remembered, getting these ingame isn't hard (I just followed the readme from the texture pack I made and edited the terrainmaterials.2da to add the new textures), so go ahead and request what sorts of modern/sci-fi textures you'd like to see. Yes, I don't think that would get used because of the scaling issue. The texture itself looks really good though. A few thoughts: concrete, gravel, gratings, wood chips, bark mulch, damaged asphalt, garbage, debris, tread plates, worn rubber, grunge, astroturf, and anything sci-fi. You might also look at some of these. A few of them seem modern. He does nice work. 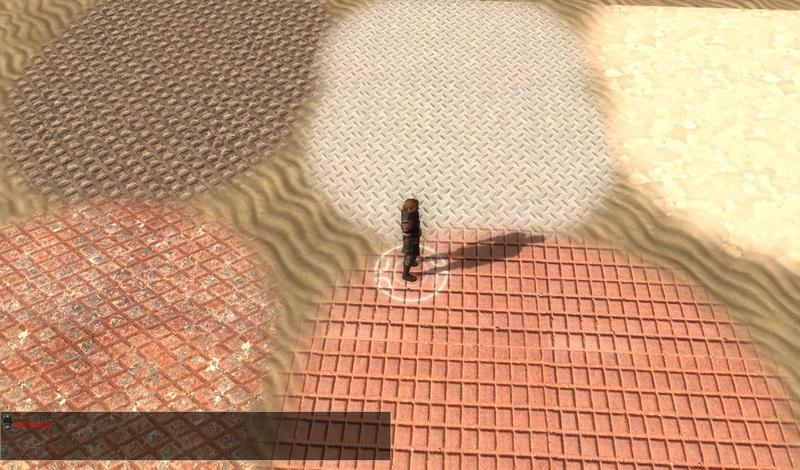 Various asphalt, carpet, concrete, gravel, metal, mulch, stone, tile, turf, plywood textures. They still need some work as they are all shiny in the sun and probably need better normal maps. But I put the whole thing together in a couple of hours. Also I need to apply what I learned here to my original set of custom textures.